(Phys.org) -- Many organic contaminants in the air and in drinking water need to be detected at very low-level concentrations. Research published by the laboratory of Prashant V. Kamat, the John A. Zahm Professor of Science at the University of Notre Dame, could be beneficial in detecting those contaminants. The Kamat laboratory uses Surface-Enhanced Raman Spectroscopy to make use of silver nanoparticles to increase the sensitivity limit of chemical detection. 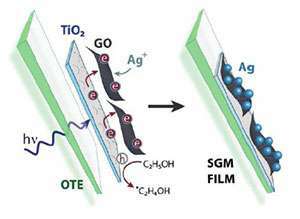 Researchers in this study have prepared a semiconductor-graphene-metal film that has distinct advantages: The absorption of organic molecules on the films graphene surface increases the local contaminant concentration adjacent to silver nanoparticles. More information: The paper, Electron Hopping Through Single-to-Few-Layer Grapheme Oxide Films: Side-Selective Photocatalytic Deposition of Metal Nanoparticles, was published recently in the Journal of Physical Chemistry Letters. Authors are Ian Lightcap, Sean Murphy, Timothy Schumer and Kamat. The research was supported by the Office of Basic Energy Sciences, Department of Energy.